The Northern Plant Ecology Lab has moved! Dr. Johnstone was a professor at the University of Saskatchewan from 2006-2017, where she founded the Northern Plant Ecology Lab (NPEL). She left her full-time faculty position at the U of S at the end of September 2017. She now runs the NPEL as a freelance researcher based in the Yukon Territory, with connections to the University of Saskatchewan (adjunct professor) and the University of Alaska Fairbanks (research affiliate). The NPEL continues to exist as a virtual group of past students and collaborators. 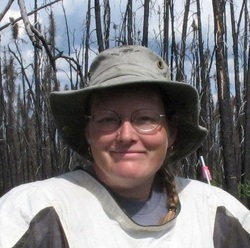 Dr. Johnstone's main research interests are focused on how disturbance processes may interact with climate change to drive future vegetation dynamics of boreal forest﻿ and tundra ecosystems. In particular, how are changes in disturbance regimes, such as altered fire frequency and severity, likely to influence forest responses to directional climate change? Once a disturbance has occurred, what are the effects of climate warming on plant regeneration and colonization processes? After the initial period of community assembly, what types of biotic and abiotic interactions are responsible for shaping subsequent trajectories of succession? Are disturbances likely to create windows of opportunity for southern species to invade northern communities as the climate warms? What do these interactions mean for management of human disturbances or the prediction of future changes in northern ecosystems over coming decades or centuries? Background: Jill was born and raised originally in Vermont (USA) and is a citizen of both the United States and Canada. She first developed an interest in northern ecosystems when studying at Middlebury College with Dr. Bill Howland in the early 1990's. After completing a M.Sc. degree in arctic plant ecology at UBC with Dr. Greg Henry, Jill spent 10 years living and working in the Yukon and Alaska. During this time, she completed a Ph.D. on boreal forest ecology at the University of Alaska Fairbanks with Dr. F. Stuart (Terry) Chapin, III. In 2006, Jill started up the Northern Plant Ecology Lab at the University of Saskatchewan, and was promoted to full professor in 2016. She left the U of S in 2017 in order to live a more balanced lifestyle in the North. Jill now remains active in northern research as a freelance researcher based near Whitehorse, Yukon.